Although I wouldn’t have known it last Thursday, when seven inches of snow fell. Dozens of robins rode out the snowstorm on our front porch, in our magnolia tree, our garden, and as we discovered yesterday, in front of our garage doors. Now, we’re having a great meltdown of the snow as our temperatures the last few days are in the 30s and 40s, almost reaching 50 degrees. Wow. I went outside last night and this morning with just a light jacket on instead of an overcoat. We Pennsylvanians have been moaning about the long, cold, and snowy winter since January. We’re all ready for spring. Everything I’m involved with outside my home has been cancelled at least once, or there were times when I didn’t go because I didn’t want to take a chance on bad roads or slippery sidewalks, steps, or parking lots. Since falling in Israel last year, I’ve become very cautious, because I’ve fallen twice since. To God’s credit though, I’m not hurting myself more than skinned knees and bruises the last two times. 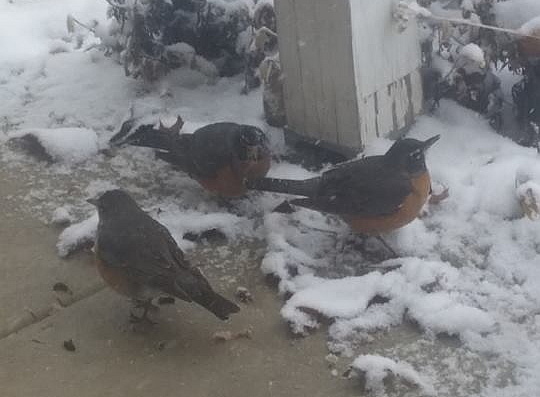 I’d never seen robins that fat before. 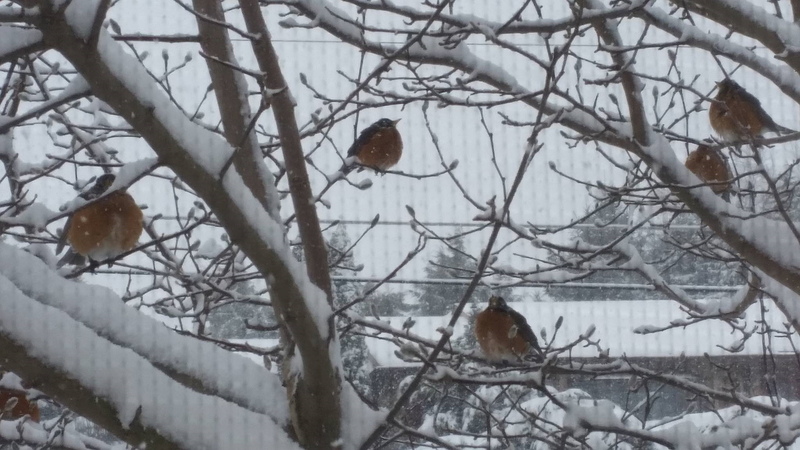 I didn’t even know they were robins, but I posted this picture and another on Facebook, and people told me they were robins. I also Googled, and found pictures of fat robins. Evidently, they puff up when cold. I was wondering if that helped protect their organs from freezing. I posted what I felt is the “prophetic” significance to that many robins coming to our house on a new page under “Prophetic Impressions.” Prophetic just means that I’m feeling God wanting to speak, so I’ll relay what I’m hearing, and you can be the judge. Generally speaking, when someone gets a prophetic word out of nowhere, so to speak, it’s for them, and them alone. But sometimes, even a personal word can be a blessing for wider reading. I’ve only ever one other time felt a word for more than just me. It was the day I heard Elizabeth Smart had been found alive. You remember her. She was a teenager kidnapped from her bed and was found about a year or so later. An amazing story. I’ve read her book about it. She’s a survivor. But this word, I believe, can be for anyone who wants encouragement, because that’s one of the purposes of modern-day prophecy (to edify, exhort, and comfort). So, check out my page. You can access it here. Leave a comment here or on that page, and let me know what you think. Can you handle spring coming – in more ways than one?